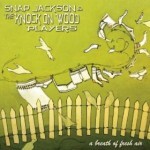 Snap Jackson & the Knock on Wood Players is an award winning acoustic quartet hailing from Stockton, California. These four gentlemen effortlessly blend Americana, bluegrass, soul, and old time music to create a unique, fresh, and energetic sound. It is obvious from the moment this group takes the stage that they are ready to have a good time! They have been featured on the same bill with such notable acts as Alison Krauss, Old Crow Medicine Show, Carolina Chocolate Drops, Punch Brothers, Della Mae, Steep Canyon Rangers, and Vince Gill, just to name a few. Whether it’s a winery, theatre, club, or an outdoor festival, these boys are sure to leave a lasting impression. In July of 2006, after hearing John Hartford’s Mark Twang album, singer-songwriter, Snap Jackson, walked into a music store in Stockton, California and purchased his first banjo. He has been obsessing over it ever since. Aside from playing both Scruggs Style and clawhammer banjo, Snap also plays the ukulele, blues harmonica, and mountain dulcimer. 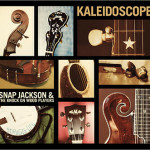 In recognition of his efforts, Snap received the Male Vocalist of Year Award in 2015, in addition to nominations in 2013, 2014, and 2015 for the Northern California Banjo Player of the Year award. He also received an endorsement deal in 2011 with both the Deering Banjo Company and Kala Brand Ukuleles. 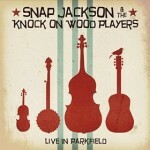 When he is not on the road fronting his band, Snap Jackson & the Knock on Wood Players, he can be found at home playing the banjo and spending time with his family. Some of Snap’s major influences include: John Hartford, Nina Simone, Tony Trischka, Jerry Garcia, Earl Scruggs, Bob Dylan, and Stevie Wonder. Shane Kalbach is a man of many talents. Since receiving his Bachelor of Music in Viola Performance from California State University, Sacramento, Kalbach has become a very respected player in the California music scene. Aside from playing fiddle, mandolin and guitar in the Knock on Wood Players, Kalbach plays principle viola for both the Merced Symphony and The Townsend Opera Players. He is also a founding member of the award winning Sacramento group, Light Rail. Despite his busy schedule, Shane has remained very active in various youth music programs including the La Honda Music Camp, Pacific Music Camp and the Central Valley Youth Symphony, where he is the conductor of the Preparatory Orchestra. A few of Shane’s major influences include: Jeremy Garrett, Bobby Hicks, Megan Lynch, Kenny Baker, Darol Anger and Stuff Smith. Eric Antrim and Snap Jackson first met at the 2010 C.B.A. spring campout and instantly hit it off. After relocating to Fresno County, he joined the Knock on Wood Players on November 11, 2010. Eric enjoys playing the guitar, and has, ever since he received one from his mother on his 15th birthday. Before playing with the Knock on Wood Players he was a member of the Sonoma County band, the New Stumptown Rounders. Besides playing music, Eric enjoys rock hounding, gardening, and working with his girlfriend, Hannah, on her family’s farm. In 2014 Eric received an endorsement deal with Bourgeois Guitars. A few people who have inspired Eric musically are: Tony Rice, Jerry Garcia, Doc Watson, Clarence White, The David Nelson Band, and The Stanley Brothers. As the son of two musical parents, Brian Clark was exposed at an early age to a wide range of sounds. His first professional gigs came very early on, performing with the San Francisco Boys Chorus and the San Francisco Opera Co. Brian picked up the bass in Junior High school and has never looked back. He studied Classical String Bass Performance at both Delta College and the University of the Pacific in Stockton, Ca. He has been a member of several bands including, New Clear Days, The Valley Concert Band, the Delta College Monday Night Big Jazz Band, the international touring company, Up with People, as well as many other theatre productions. Brian continues to be a top call bassist in the Central Valley, and because of this reputation, he was asked in 2007 to head the Artist Relations department for the bass amp company, Gallien-Krueger. Brian’s major influences include: Edgar Meyer, Ray Brown, Scott LaFaro, Thelonious Monk and Johann Sebastian Bach.